Tinsley Ellis epitomizes the music of his home state of Georgia. Filled with soul and a vibe that embraces and yet goes beyond the blues, his work is masterful in both technique and feeling. Born in 1957, his career took off in 1988 with Georgia Blue and has not looked back since. Having produced CDs for in several stints for Alligator, one with Telarc and other labels, Tough Love is his third offering on his own label. Using vintage, classic equipment, the sound here ranges from smooth to rocking yet each has its’ own uniqueness and charm. “Seven Years” kicks things off and Ellis begins with a finger picking, soulful groove. He sings of his relationship of seven years that is thrown away after a one night stand by his woman. He sings with emotion and a hollowness in his soul that represents having his feelings ripped out from him. The song brings it all out as he bares it all and then he gives us a stinging solo on his six string. “Midnight Ride” is a jumping and jiving song that bounces and gets you wanting to dance. 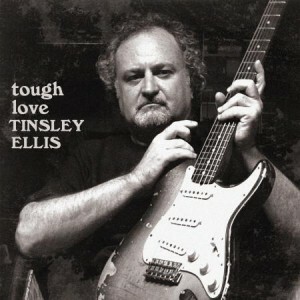 There is lots of that great Tinsley Ellis signature guitar work that really burns it up here! 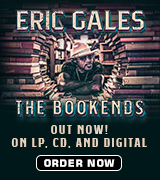 “Give It Away” follows; Ellis takes it down several notches and gives us a distinctively soulful ballad to savor. Well done! In “Hard Work” Ellis gets another groove going as he sings how hard it is to live when you have no work. Some excellent commentary surrounded by some excellent music! The big hit song for this album is next: “All In The Name of Love” is quintessential Tinsley Ellis. It is a really soulful, bluesy slow cut with a distinctive beat that grabs you and does not let go. Great vocals and the added horns with sweet organ work make it a big time hit. Add in Ellis’ guitar and vocals and it goes right over the top- in my estimation it is one of his best songs ever. “Should I Have Lied” is slow blues done up sultry and sweet. A dirty guitar solo opens things and sets the tone. He then similarly guts out the lyrics as he wails on about lost love. He picks it up again with “Leave Me.” The tempo is certainly built up and the intensity grows as the song completes. More great guitar work with everyone in solid support. “The King Must Die” takes things back down as Ellis offers a big time solo with echo and reverb that gives an even broader feeling to the solo. He apparently sings of mythical times gone by here in a dark and strikingly cool song and performance. Ellis plays a little harp for us in “Everything.” It’s a jumping swing cut with some barrelhouse styled piano and Tinsley squeaking out some cool harp. “In From the Cold” concludes the set and Ellis adds a little Wurlitzer piano to the mix. Another slow, bluesy ballad again here as Ellis emotes and asks to be taken in from the cold. He goes into the stratosphere with his guitar solo and the band is right there with him, building up to great heights on the chorus. Lots of bass makes this darker and cool and the organ adds more layers of feeling. Ellis claims he has never been prouder of his work and I can see why. This is an album of original cuts that focus on the theme of the album, Tough Love. Ellis has hit another home run here. This is really a super set of tunes that build on and complement each other. Every listen seems to offer up something new and enjoyable. 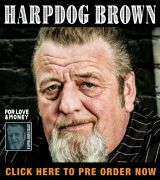 I highly recommend this one, blues fans!